With a fleet of recovery vehicles and HIAB machinery and specialist lifting and recovery equipment, Recoverymen can recover your stricken vehicle as soon as is physically possible. Our friendly and helpful team will ensure that your car van or truck is recovered and relocated to a convenient location in the fastest and safest possible time. Whether you’ve run out of fuel or your vehicle just isn’t starting, or has broken down, we cater for all vehicle sizes so call Recoverymen today and let us help get you back on the road in no time at all. 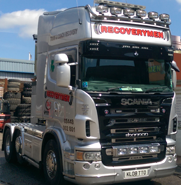 To arrange the recovery of your vehicle, call Recoverymen today on +44 (20) 8452-4044 or use our enquiry form. Recoverymen offer you a high quality heavy recovery and recovery service for trucks, cars, agricultural vehicles, plant and vans. We supply accident units and wreckers for street lifting and tilt and slides and have a 24 hour callout service second to none.